New Feature! Add a LIVE slideshow of your market to your website! 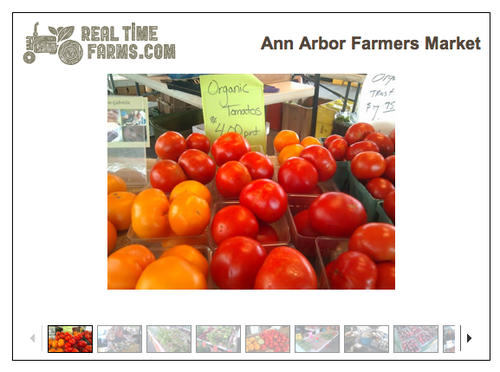 Add a LIVE slideshow to your website of pictures posted to Real Time Farms of your market! Are you a farmers’ market manager, a blogger, or just a fresh, local food enthusiast? Would you like a LIVE feed slideshow of the images taken at your market on your own website? Thanks to our new intern, Andy Kish, we now have html code that you can embed into your site (or for those like me who are less technologically savvy, that you can email to your webmaster) to create the slideshow on your site. People can get a real feel of the people, the colors, and the seasonality of your market by seeing how it changes throughout the year and what is available right now! People will be inspired to add images because they know they will be instantly adding to not only the content on Real Time Farms, but to the content on your own site! Help spread the word of your local market! 3) Follow the instructions, and VOILA! As images are loaded, they will be added LIVE to your slideshow on your own website! If you have any questions or comments, we are happy to answer them at feedback@realtimefarms.com. This entry was posted in Messages From the Founders and tagged Andy Kish, bloggers, farm stands, farmers markets, live slideshow, local food, Real Time Farms. Bookmark the permalink.